We aim to be more than just an accounting firm. 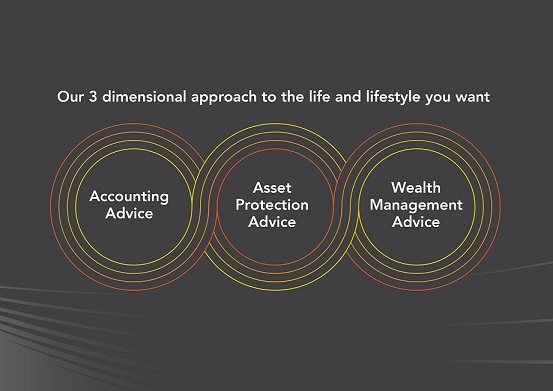 We support our clients to help them achieve their personal and business goals by offering a fully integrated advisory service, helping clients to ‘build wealth & protect their assets’. We realise a great deal of hard work has gone into building your asset base. Before discussing any growth plan we ensure what you have built is as protected, secure and in your control as possible. Protecting yourself, your family and your business is the most important first step of any growth strategy. Correctly structuring your personal affairs to minimise risk exposure whilst providing a solid platform to build your wealth is what we call ‘Asset Protection’. Our objective is to provide you with greater control over your Assets whilst allowing for more measured outcomes in times of dispute or financial distress. A well-structured Asset Protection programme gives you peace of mind knowing you have control, leverage and a ‘seat at the table’ should anything go wrong in the future. In some cases people unknowingly have their assets exposed and risk losing some or all of their wealth. We have a diverse team of experts to accommodate your needs. We have developed an experienced financial services team, Rundles Financial Planning and partnered with a specialist in wealth management & asset protection, Primestock Securities Ltd. (Primestock) Australian Financial Services Licence 239180.